Loaded atop a United Launch Alliance Delta 4 rocket, the $342 million Wideband Global SATCOM 5 satellite headed skyward from Cape Canaveral at 8:27 p.m. EDT en route to a supersynchronous transfer orbit. Forty-one minutes later, the powerful booster successfully released the 13,200-pound payload into an orbit looping as high as 36,125 nautical miles, as low as 237 miles and tilted 24 degrees to the equator. Controllers at Boeing's facilities in El Segundo, Calif., will maneuver the satellite into a circular geosynchronous orbit by early summer, allowing the craft to match Earth's rotation and appear fixed above the globe. An extensive checkout and commission process that will stretch into next year to ready the satellite for operations from 52.5 degrees West longitude for its mission to provide communications support to the Americas. "WGS 5 will provide three new capabilities that expand the constellation -- increase in capacity to the U.S. and six international partners, expanded coverage leading us to near-worldwide coverage at this point and, with operational acceptance of WGS 5, we will be able to achieve full operational capability of the system," said Luke Schaub, chief of the Wideband SATCOM division of the MILSATCOM Systems directorate at the Space and Missile Systems Center in Los Angeles. Known as WGS 5, this satellite is the fifth in a major program to upgrade to the military's main communications infrastructure, replacing the aging Defense Satellite Communications System (DSCS) spacecraft. Each WGS has 10 times the capacity of a DSCS satellite, allowing users to process and receive data quicker than ever before. "WGS is the DOD's highest capacity communications satellite system. These satellites provide tremendous operational flexibility to deliver the needed capacity, coverage and connectivity in support of demanding operational scenarios for DOD and allied forces worldwide," said Boeing WGS Program Director Mark Spiwak. "We have four in operation today. Those four are pretty much located on the other side of the globe from the United States. They're really located strategically between the eastern Atlantic and the western Pacific. Today, we do not have any WGS capability over the continental United States," Schaub said. "This satellite is being launched into an orbit at 52.5 West, which is off the east coast of the United States, with the intention of closing that gap and providing, with its transfer into operations, near-worldwide coverage." The inclusion of WGS 5 will extend the Wideband Global SATCOM constellation to the Americas for a host of users. "It gives us the CONUS coverage we don't have today," Schaub said. "Think of it as this whole region, so NORTHCOM, SOUTHCOM, TRANSCOM, STRATCOM, MDA, a whole lot of U.S. and western hemisphere-based users will be using this satellite," Schaub added, referring to U.S. Northern Command, Southern Command, Transportation Command, Strategic Command and the Missile Defense Agency. The craft's communications package provides shaped, steerable spotbeams of bandwidth wherever requested across its field-of-view for X- and Ka-band frequencies, plus the onboard capability to switch signals from one band to the other. "WGS is the only military communications system that can support simultaneous X- and Ka-band communications with cross-banding that makes communications across terminal types transparent to the warfighters," Schaub said. "Virtually anything you can imagine doing (with communications) is what we support, primarily focused on areas that are hard to access with our landline systems," Schaub said. "It runs the gamut from soldiers in the field to large operations and ships, video teleconferencing, voice, a lot of data transfers, the RF bypass that we're adding is really intended to allow for rapid transfer of data." Three earlier satellites were built by Boeing as the Block 1 series and WGS 5 becomes the second of the upgraded Block 2 generation. "The WGS Block 2 satellites provide higher total throughput than Block 1 satellites with the addition of a radio frequency bypass capability," Schaub said. The bypass feature allows unmanned aerial drone communications to skip the crossbanding path and use two uplink and two downlink channels for three times the bandwidth as the normal channels, opening up a much bigger pipeline for data to flow. "Like the existing on-orbit satellites, WGS 5 will provide protected, wideband communications to users anywhere in its field-of-view. WGS 5 also provides a switchable radio frequency bypass capability that supports the transmission of AISR (airborne intelligence, surveillance, and reconnaissance) mission data at data rates that are approximately three times greater than currently available," Spiwak said. Boeing has completed the WGS 6 satellite, which was shipped to the Cape last week for its launch in early August aboard the next Delta 4 rocket. The craft was built with funding from Australia as part of an international partnership on the communications system. Satellites 7 through 10 are under construction at Boeing's factory in El Segundo for launches in the coming years. "It's about adding additional capacity," Schaub said of putting five more satellites to the constellation. "We know there's an insatiable appetite for (satellite communications)." WGS 9 is being built on a multi-lateral agreement with Canada, Denmark, Luxembourg, The Netherlands and New Zealand, bringing those nations into the network as well. "The amount of capacity that is provided to each of the international partners is a stair step that increases with the launch of each satellite. So both Australia and the multi-lat will get additional capacity with the launch of this WGS 5 satellite," Schaub added. Friday's launch was the first for the Delta 4 rocket since it experienced an upper stage engine leak and lower-than-expected thrust while successfully deploying a GPS satellite seven months ago. Although that investigation remains ongoing, officials cleared the Delta 4 for flight after ordering extra inspections on the powerplant for the WGS 5 mission, instituted in-flight helium purges and changed how the engine was thermally conditioned prior to ignition during the launch. "The team has worked tremendously hard and exceptionally well to complete a robust investigation and get us to a successful launch today," said Jim Sponnick, United Launch Alliance vice president of mission operations. There were no reports of any troubles during the flight, which marked the 22nd for a Delta 4 rocket since 2002 and the third to carry a WGS satellite. It was ULA's 71st mission in 77 months, the fifth this year and the second in just 9 days. Next up will be another Atlas 5 on July 19 carrying the Navy's second MUOS mobile communications craft. Delta 4 plans to perform the WGS 6 deployment from the Cape in early August and a classified Heavy launch for the National Reconnaissance Office from Vandenberg Air Force Base, Calif., in late August. 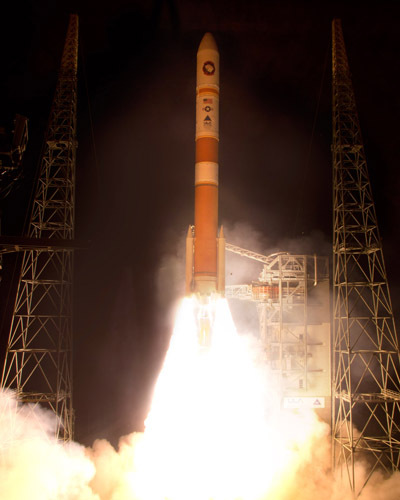 One further Delta 4 launch is planned this year, the program's 25th overall, in mid-October from the Cape with the GPS 2F-5 navigation satellite.